Acute pericarditis after a heart attack occurs when the body's immune system goes into overdrive to clean up damaged tissue. The immune system mistakes healthy heart tissue as damaged and attacks it, resulting in more damage and inflammation. Thanks to the use of clot-busting drugs, which limit heart muscle damage and inflammation, this complication has become considerably less common. Still, acute pericarditis can be life-threatening when untreated, and recovering heart attack patients should report any symptoms immediately, whether they are still in the hospital or already home. Acute pericarditis develops when the two layers of the sac containing the heart — the pericardium — become irritated and inflamed. The swelling causes the two layers to rub against each other with each heartbeat. Normally, a small amount of fluid is located between the two layers, providing lubrication for the heart's movement. Acute pericarditis may cause excess fluid to accumulate within the heart sac, interfering with the heart's beating and leading to symptoms of heart failure. Excess fluid can also build up in the lungs, making it hard to breathe and increasing the risk of pneumonia. Acute pericarditis is considered "early" if it occurs within the first week of the heart attack; this type of pericarditis affects about 10 to 15 percent of people who have had a heart attack. This type of pericarditis usually resolves in short order in just a few days with treatment. Late pericarditis, also called "Dressler's syndrome," affects about 1 to 3 percent of people who have had a heart attack. This form of pericarditis occurs weeks or even months after the actual heart attack and may recur even after seemingly successful treatment. The inflammation of this form of pericarditis is more widespread, affecting larger areas of the pericardium. The pain may be in your chest, back, shoulder and/or abdomen. It may be constant or come and go, and often worsens when you try to take a deep breath. The pain may be at its worst when you are sitting up straight and may improve a bit if you lean forward. You may feel uncomfortably anxious. 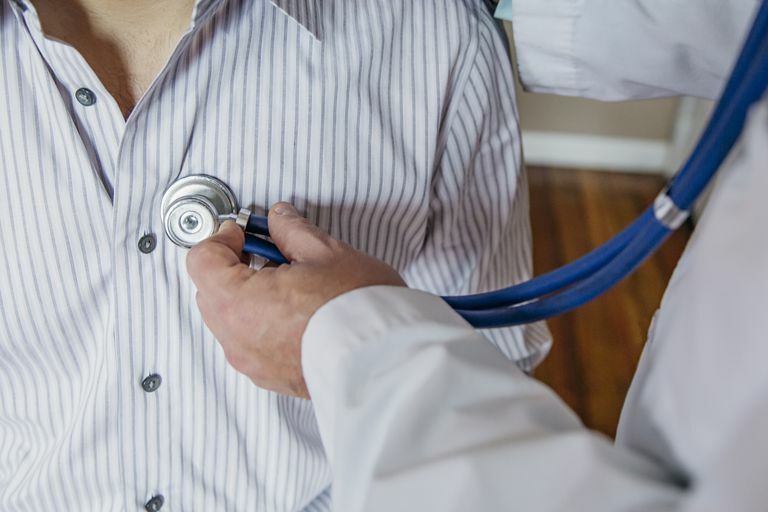 Your doctor will likely check for telltale sounds when listening to your heart with a stethoscope. A characteristic sound called a "rub" occurs because of the friction caused by the two swollen surfaces of the pericardium. The swelling and any extra fluid accumulation also cause your heartbeat to sound more muffled and quieter than usual. Tests to confirm the diagnosis may range from a chest x-ray and blood tests to an ECG and echocardiogram, in which sound waves create a moving image of the heart. Medication, such as nonsteroidal anti-inflammatory drugs or aspirin, steroids or the anti-inflammatory drug colchicine in more severe cases, usually quells the inflammation. If you have a lot of fluid in your heart sac, then a procedure called "pericardiocentesis" may be required. In pericardiocentesis, a very thin needle or tube (catheter) is placed through your chest wall and into the heart sac, and excess fluid is withdrawn, improving your heart's function. Most cases of acute pericarditis resolve with any ongoing complications. Promptly treating the initial episode seems to decrease the risk of recurrence. Hoit, B.D. "Pericardial Disease and Pericardial Tamponade." Critical Care Medicine 35(2007): S355-64. Manning, Warren J. "Pericardial Diseases." Cecil Textbook of Medicine. Ed. Lee Goldman. Philadelphia: Saunders, 2008. Winter, Martin M. "Pericardial Diseases." Braunwald's Heart Disease: A Textbook of Cardiovascular Medicine. Ed. Peter Libby. Philadelphia: Saunders, 2007.